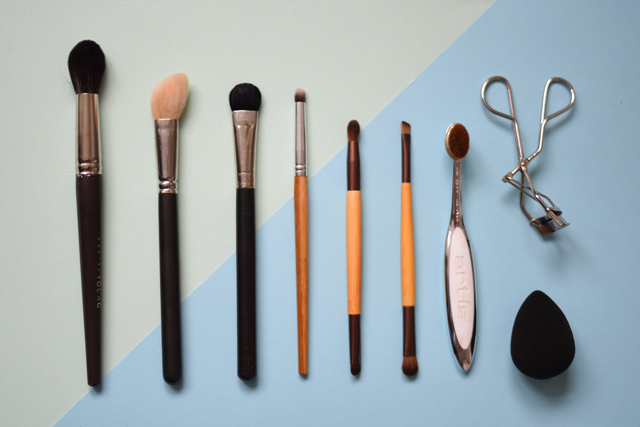 Why do you need eight makeup tools? Well, sometimes you don’t, but sometimes you do. 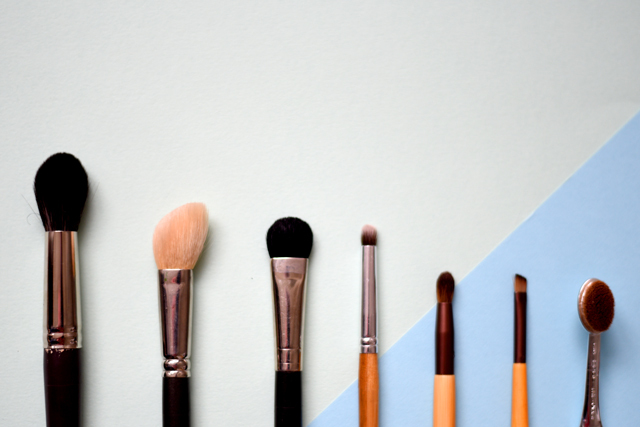 Truthfully, there are a million ways to do makeup, and there is enough information out there about all the basics you need to apply your own make up nicely. However, if you are ready for a step further, here is my selection of Pro Tools to make your makeup GREAT. I have had most of these for years, and many companies offer versions of what we show here. 1. The Beauty Blender (the big squishy thing on the right): I confess that when they first appeared on the market, I was really skeptical that this miracle sponge could be the best tool. But I have grown to love it and use it all the time. I find it especially useful when you need more coverage to look natural, so if you have skin imperfections you want to hide, or are doing a fuller coverage for a glam or evening do, this is the best way to blend your foundation. There are many imitations, but I still find the original beauty blender brand the best. Definitely get its branded cleaner to wash the sponge with. 2. The Artis Brush (first from the right): I was immediately drawn to these when they first emerged, before they became an Instagram sensation and were available everywhere. The concept was revolutionary, with a design meant to be more ergonomic for personal use and fibres developed for the use of cosmetics. Since Artis brush became popular, many imitations of varying prices have appeared, but I am always a fan of original innovators and have heard poor reviews of copied counterparts. Shown here is The Oval 4 which is my preferred size for overall blending and buffing. 3. Lash Curlers (metal tool on the right): Use. Every. Day. (even if you do nothing else) I repeat: EVERY. DAY. I like Shu Uemura and Suratt Curlers. If your lashes are really straight and don’t bend easily, warm with a hairdryer for a few seconds. Always squeeze at the base of the lash and then “step” it out to the tips. 4. Eco Tools Double ended brushes (second from the right): These are PERFECT for your makeup bag, especially if travelling. It’s a perfect selection of 4 eyeshadow brushes in 2! You can apply base shadow, blend, blend the crease, do your eyeliner and voila’, full eye makeup! 5. 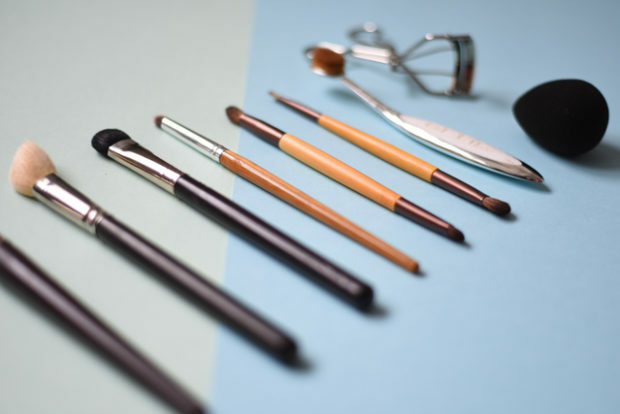 A small round blending brush (fourth from the left): Most people would use this for blending the crease of the eye, but I like it for concealer, especially to blend out spots, or get into the deep corner of the inner eye, or even to cover the little bit of redness around the nose. Tap to apply product and make small circular motions when blending. Shown here is Everyday Minerals Smudge Brush. 6. A Short Fluffy Flat brush (third from the left): I use this tool to powder base and concealer. 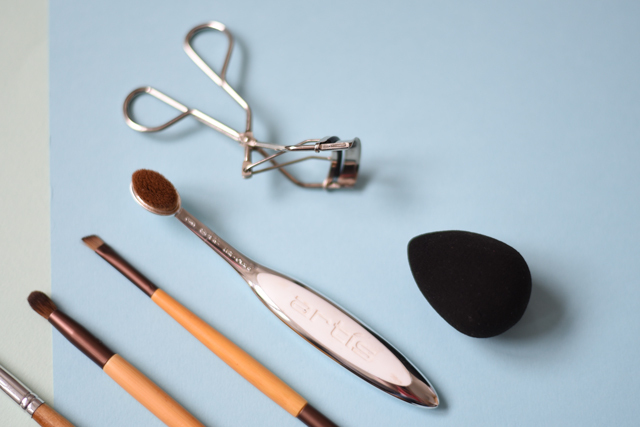 Because it is flat, it places powder perfectly under the eyes around the nose when I use a patting motion, without the heavy finish of a powder puff. I can also use it “sideways” or head on, to brush away excess powder, fallen eyeshadow or stray lashes and brush hairs. (This brush is from MAC but they no longer make this exact one). 7. The Angled Blush Brush (second from the left): This brush is perfect for contour or blush. It fits beautifully under the cheekbone to blend shading powder, but fits neatly on the apple of the cheek if you want to use it for blush. If you do both, clean the brush in between product, or get two of them. (Here is MAC 168). 8. A Tapered Fluffy Brush (first on the left): This is great for blush or powder. I find way too many of these types of brushes too wide and fluffy. To keep your makeup neat and professional, it is key to have more precise tools, so you don’t end up depositing colour all over your face. This brush by LY49A by Louise Young is a perfect size and shape (again, if you want to use the same brush for different products, clean in between or get more than one). The final essential Pro Makeup Tool I can’t live without are my tweezers, which didn’t make the picture. I use Tweezerman and I love the Petite Tweeze set which consists of small angled and fine point tweezers. I am also fond of Japonesque tools for brows (and lashes actually). Quality brushes will last you years, just remember to shampoo them regularly either with a gentle soap like the Dr. Bronner Pure Castile Baby Soap, or I also use a Goats Milk Brush cleaner because it conditions as well as cleans Try London Brush Company or your local art store. Born and raised in Montreal, Tahira moved to London in 2006 to to pursue dreams of living and working in a buzzing metropolis to continue growing and developing as a Makeup Artist. Her career has taken her all over the globe, working with some of the best people in film, fashion, advertising and editorial photography and film. In the past few years, she has begun sharing her pro tips on beautybytahira.com as well as contributing to dresslikeamum.com and here at Ladyland! Our guest posts are written by small band of dedicated contributors. If you’re interested in writing for LADYLAND and have a wonderful idea you just have to share, email us thisisladyland@gmail.com.